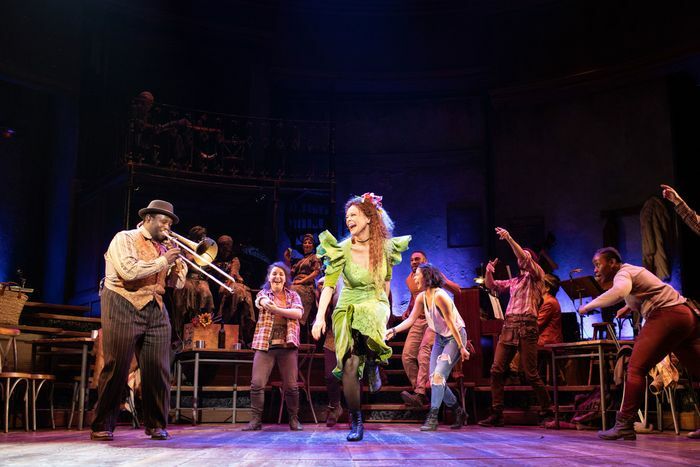 To use the appropriate organic metaphors, Hadestown started as a seed with a community-theater project that Mitchell, a songwriter, first performed in Vermont in 2006. That grew into a concept album in 2010, which she recorded along with folk musicians like Bon Iver’s Justin Vernon. By 2013, Mitchell started working with Chavkin — who had been directing The Great Comet Off Broadway — to plant Hadestown back onstage. They took it to New York Theatre Workshop in 2016 and then to Edmonton’s Citadel Theatre and London’s National Theatre before returning to Broadway, where the show began performances on March 22. Along the way they experimented with everything from the set design, to the size of the cast, to their way of thinking about the main characters’ roles in the story. 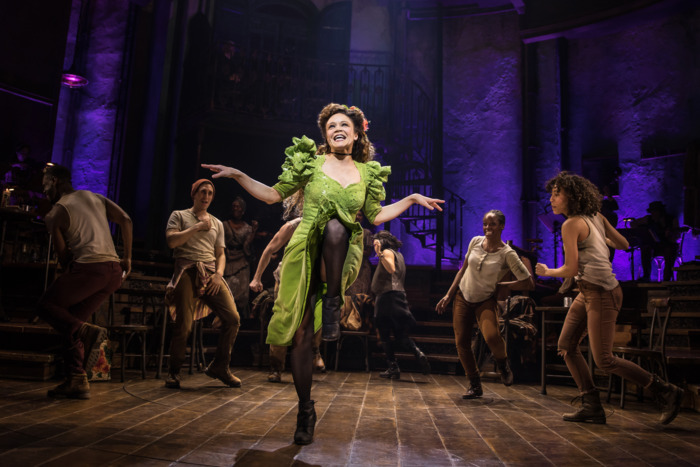 Mitchell started work on Hadestown when she was starting out as a songwriter. “I would go to a show of even my favorite songwriter, and I would start to get bored,” she said. 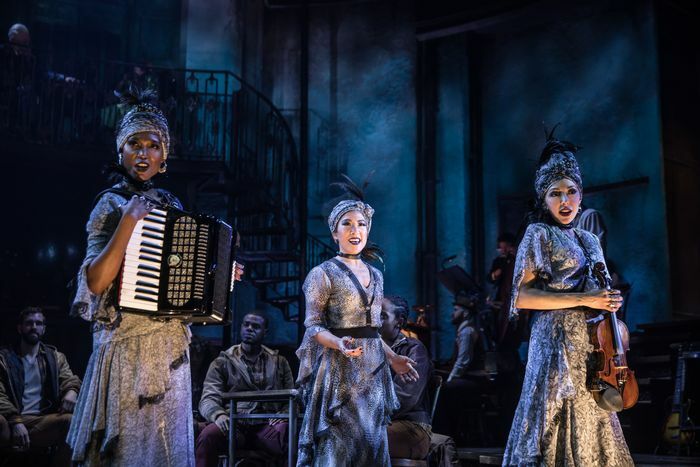 “Because it’s just so many songs in a row.” Inspired by song-driven theater pieces like Les Misérables and Sweeney Todd, she was drawn to the idea of developing a larger narrative in music. She developed Hadestown in a DIY form in community theaters in Vermont, where it had something of a plot, but was largely a concert piece. In the summer of 2014, Mitchell and Chavkin started working together on Hadestown in earnest with a workshop at Dartmouth through a New York Theatre Workshop residency. “It was many, many late nights with booze and singing,” Chavkin recalled. “There were a lot of new songs,” Mitchell said. “[But] at the end of the thing, everyone was like, ‘Great songs, but we have no idea what’s happening.’” That’s when they developed the character of Hermes (then played by Taylor Mac) into a narrator and provided recitative, musical dialogue for the characters between songs. 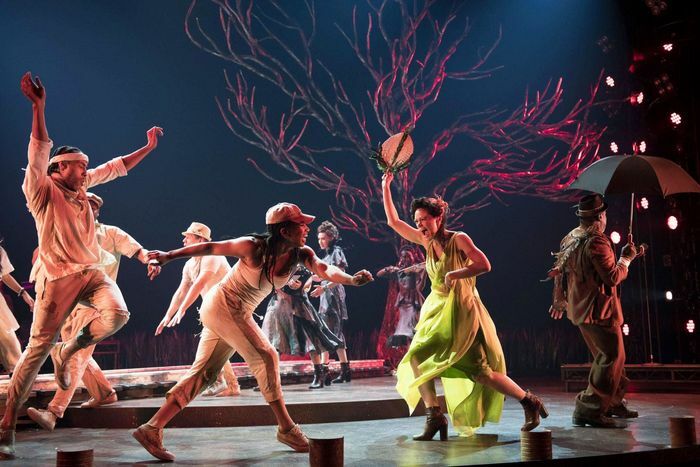 By 2016, they brought the show to New York Theatre Workshop proper, where they faced a lot of the literal questions that come with staging: What’s the scenic design? What are the costumes? What’s the choreography? They settled on an aesthetic that recalls both an amphitheater and a music hall, mixing Greek elements with Americana. There, the cast included Amber Gray and Patrick Page as the quarreling gods Persephone and Hades, both of whom have stayed with the show throughout the rest of its development, and grounded it, according to Mitchell and Chavkin. “There’s something sort of ‘just add water’ about the couple,” Mitchell said of their performances. “Who doesn’t love a ruined older marriage?” Chavkin added. Canada was also where Chavkin and Mitchell realized a few ideas wouldn’t work. 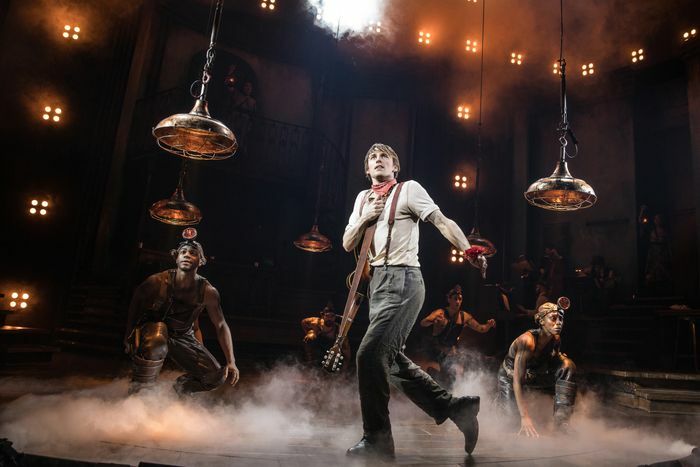 Initially, they worked with set designer Rachel Hauck to place the opening of the show on a set of railroad tracks to hell, an emptier setting that would leave many of the actors offstage, unlike the concert format at NYTW. “It was very bleak and very beautiful,” Chavkin said. “And we got into tech and it was awful. We sucked all of the life and vibe out of this show.” They cut “three-quarters” of the Act One set and brought Gray and Page’s gods back onstage at the top of the show — sitting by themselves like they’re “having oysters and waiting to enter” — in an attempt to re-create the more communal vibe the show had in New York. In London, Mitchell and Chavkin had more time — and money, given the theater’s generous government subsidies — to expand on the ideas they’d been working on in Canada. “London was really the first time that David got to spread his wings and have an ensemble that was truly able to execute some major movement,” Chavkin said of the choreography. 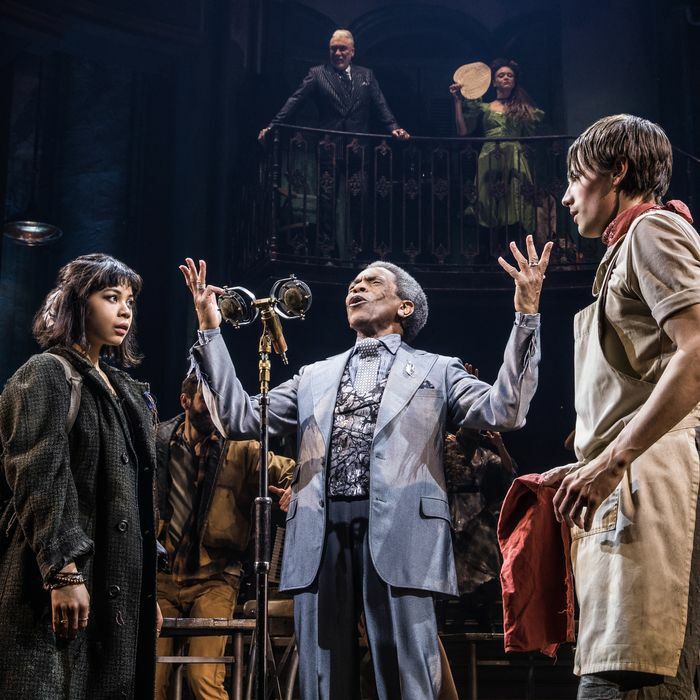 It was also when Hadestown got time with the National’s elaborate turntable and left mechanism, which also became integral to its Broadway staging. “There are these beautiful moves [in the choreography] that then are further mechanized with the use of the turntable,” Chavkin said. 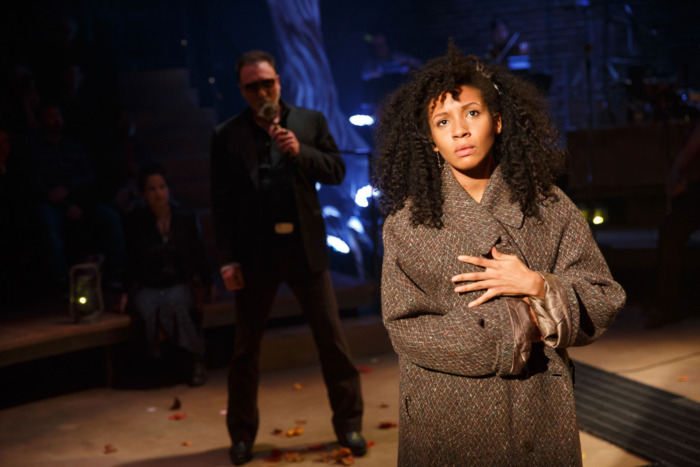 Preparing for their opening on Broadway, Mitchell and Chavkin were still refining elements of Hadestown and continued to develop Orpheus as a character. “Reeve’s work has grown and altered and deepened in terms of the character work because there’s now so much more specificity built around him,” Chavkin said of his performance. Carney joked that he was glad he wasn’t asked to reaudition for the role because “it’s completely different,” Mitchell recalled.